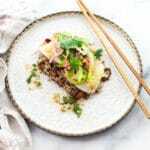 Flaky Pan Seared Halibut is topped with a tangy, spicy slaw with Nuoc Cham dressing for an impressive, healthy dish! To make the Halibut: Bring the halibut to room temperature. Pat the surface of the fish with paper towels to dry thoroughly. Season each side with salt and pepper. Preheat a large frying pan or cast iron skillet over high heat. Add enough grape seed oil until it reaches about 1/8 inch of the side of the pan. Heat until oil starts to shimmer. Carefully add each fillet to the pan, presentation side down, lightly pressing down the flesh with a spatula to create a golden crust. Reduce heat to medium-high and cook for 4 to 5 minutes. When the bottom of the fish is golden brown and not sticking, carefully flip to the other side. Reduce heat to medium-low and heat until cooked through, making sure not to overcook the fillets, about 2 to 4 minutes. To make the Nuoc Cham: In a medium glass mixing bowl, whisk all ingredients together and taste for seasoning (more salt). Store in the refrigerator for up to three weeks. This also makes a great dipping sauce for Asian dishes! To make the Slaw: In a large mixing bowl, toss together the shredded cabbages, pickled onions, sliced jalapeños, carrots and cilantro. Mix in the Nuoc Cham dressing to your liking. To make the Quinoa: Cook the quinoa according to package directions. Heat the oil in a separate frying pan over medium-high heat. Sauté the shallots and garlic until translucent, about 2 minutes. Add in the shiitake mushrooms and sauté until mushrooms are golden brown. Add the sautéed veggies to the quinoa. To plate: Place a layer of the quinoa in the middle of the plate. Place a piece of halibut, golden side up on top of the quinoa. Top the halibut with about ½ cup of the Nuoc Cham slaw. Sprinkle a bit more of the dressing around the sides of the fish. Serve while hot. The Nuoc Cham and pickled onions can be made in advance and stored in the refrigerator for up to 5 days. Nuoc Cham dipping sauce is a staple at most Vietnamese tables. This sauce compliments so many Asian dishes and we’ve prepared our own version of this versatile sauce. This magic sauce goes great with seafood, but also with steak, spring rolls, Asian salads, you name it! Easy to prepare, you can whip this up in about 10 minutes! To make the pickled onions: Add sliced red onions to a medium bowl. Pour boiling water over the onions to cover and let sit for 20 seconds. Drain onions and place in jar or bowl. Heat the vinegar, lime juice, 1/8 cup sugar, chili flakes and salt in a small saucepan over medium heat until sugar has dissolved, about 3 minutes. Pour vinegar mixture over onions. Allow to stand at room temperature, until fully cooled. Cover and refrigerate up to 2 weeks.